After the tragic encounter in Maguindanao that led to the untimely passing of 44 Special Action Force cops and a still undisclosed number of Moro rebels, Senator Bongbong Marcos was quick to point out that the incident is going to have a big effect on the proposed Bangsamoro Basic Law (BBL). A day after the Mamasapano encounter, Marcos suspended the hearings on the BBL under his committee. Marcos was right in saying that the encounter is going to have an impact on the proposed law. It's safe to say that all Filipinos share the same sentiment. Both sides lost a tremendous amount of lives. Whether you are for dismissing the BBL and going in with an all out war against the insurgents or for the continuance of the proposed deal, the Mamasapano encounter had an effect on where you stand. Senator Marcos has been among those in the Senate who have been very vocal about what has transpired in Maguindanao. This generally is a good thing. The man is tackling the issue head-on and is making friends and enemies along the way. In his social media accounts - Facebook and Twitter - almost all of his posts and updates since the incident in Mamasapano are about the clash, the fallen cops, justice for the fallen, and the BBL. In his posts, he was often rational and reasonable. Then he wrote this ill-thought out tweet. 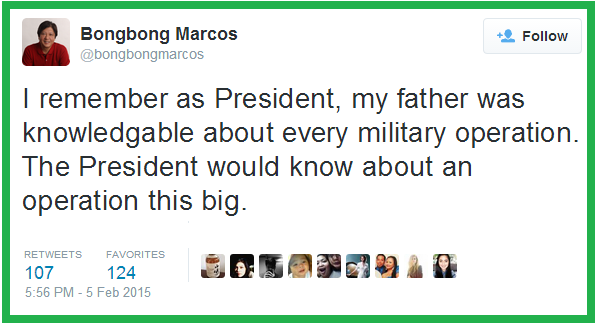 Posted on February 5, the tweet read, "I remember as President, my father was knowledgeable about every military operation. The President would know about an operation this big." Netizens rightfully jumped in and reminded the Senator about all the atrocities committed by the Philippine military and police during his father's tenure especially the ones perpetrated during Martial Law times. If we are to take Bongbong's words as truth, then he is in a way confirming all the bad stuff that the military and police had reportedly perpetrated during his father's reign. The enforced disappearances. The extrajudicial killings. The Jabidah massacre. The last one, in particular, is believed by many to be the catalyst for the emergence of the insurgency in Mindanao. If you are not familiar with the Jabidah incident, it basically was about the killing of dozens of Muslim men by the military in 1968 during which Marcos was the President. If Ferdinand Marcos knew every military operation during his presidency, then he knew about the military operation in Corregidor island which killed many innocent Muslim men. This massacre triggered the formation of the Moro National Liberation Front then the Moro Islamic Liberation Front. The rest is history - a history of violence in Mindanao for over thirty years.